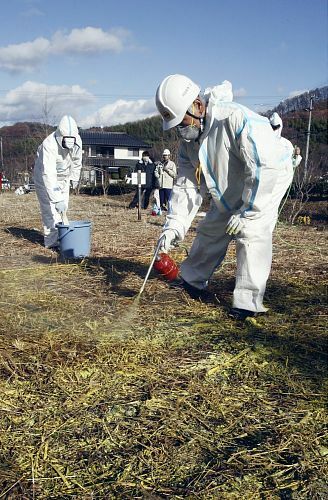 Watari District, where rice with radioactive cesium exceeding the national provisional standard has been discovered, where Professor Yamauchi of Kobe University has said again and again that “decontamination” didn’t work and that it even increased the contamination. I hear it is a very popular place for springtime cherry blossom viewing and partying, with hundreds of thousands of tourists each year visiting the place. Faced with another dismal season, the owner of the land where the trail to the mountain starts decided to “decon”. 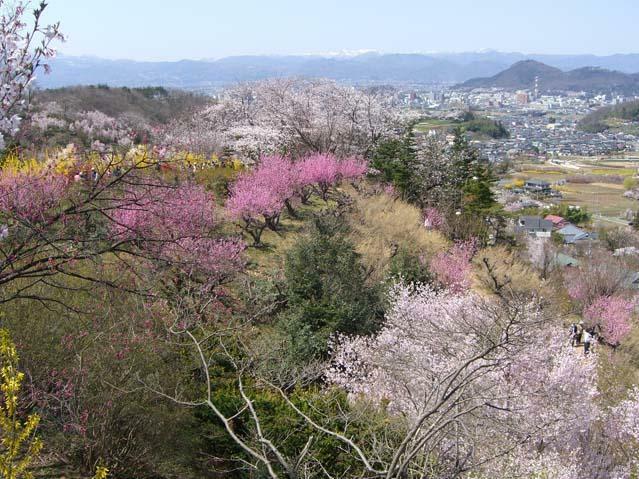 On December 10, a decontamination experiment was conducted at “Hanami-yama” [cherry blossom viewing mountain] in Watari District of Fukushima City, in preparation for the next year’s viewing season. The work was done around the trailhead. The workers sprayed the ground with the liquid solution made of sulphur and lime (“ND Lock” solution) mixed with barium sulfate. It is said that the solution is effective in lowering the radiation levels and preventing the dispersion of radioactive cesium. A 56-year-old director of a company that does decontamination work in the city says, “If it is shown that the solution lowers the radiation levels, I would like to use it to decontaminate mountains and forests. On second thoughts, as long as he gets a lucrative contract from the city or from the prefecture, I guess that’s all that matters to him, regardless of whether the true “decon” (=removing radioactive materials) is achieved. According to the manufacturer of the “ND Lock” (ND stands for “no detect”), the solution is used for asbestos treatment, and is the anti-dispersion solution for asbestos. What this has to do with lowering the radiation or preventing the dispersion of radioactive cesium, I have no idea. But in a “bubble”, anything goes, and that’s one definition of a bubble – anything goes. – Radiation in Fukushima City Order of Magnitude Higher Ther Than Offifficial Numbers?